Bares his friend's torso to viewers. 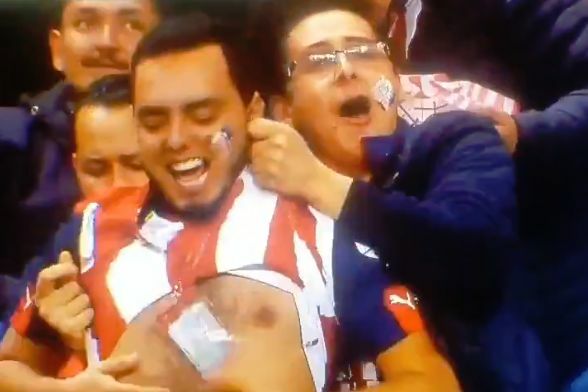 A Guadalajara fan lifted up a fellow supporter’s shirt when the camera focused on them during Tuesday’s 3-0 Copa MX win over Cafetaleros de Tapachula. After the on-loan Ronaldo Cisneros opened the scoring at the Akron Stadium, the coverage switched to celebrations in the stands. That’s when we see the man winding up his follow fan, presumably his friend, by pulling up his jersey to reveal his bare torso to everyone watching. In the Group H fixtures, Cisneros’s first-half strike was swiftly followed by an own-goal from Sebastián Ariel Ibars, with Juan Miguel Basulto rounding things off. The Mexican side are managed by José Cardozo, who scored 25 goals in 82 appearances for Paraguay in his playing days.